Question: I am just learning to fly fish, and I don’t understand mending. How do I know when to mend upstream or downstream? Answer: Mending is an aspect of fly-line control that many anglers have trouble with. Here’s a very simple definition: mending is the process by which you counteract the effects of current on the fly line, thus enabling a longer dead drift. The surface of a river is made up of many different currents. There’s fast water in the main channel; slower water flats, seams, or buffers; and even dead water behind midstream boulders. If you cast a fly line across a current and do nothing, the various currents push on your line at different rates. You can tell this is happening because the line “bellies” or gets all squiggly. If you cast across a fast current, for example, the middle of the line gets pushed downstream faster than the fly, until the line is actually pulling the fly downstream through the water. Not only does this ruin your dead drift, but it pulls the fly out of the line you were trying to fish. If your line is being pushed downstream faster than the fly, you need to counteract that by moving that section of line upstream of the fly. This is an upstream mend. A downstream mend is for the opposite situation, in which you cast across slow current into faster water. In this case, the slow water is holding the line back, so your fly can’t move as fast as the current lane it’s in. This causes the fly to drag like it’s at the end of a leash. Sometimes you may cast across several different currents, which may require an upstream and a downstream mend on the same drift. The easiest way to determine which mends you’ll have to make is to not mend at all. Cast a couple of times and watch to see how the current affects the line. 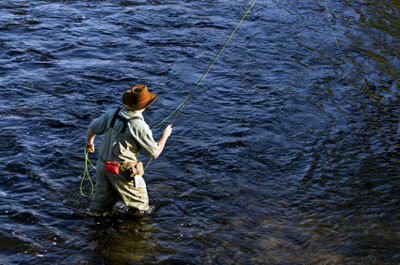 If the line races ahead of the fly, you know that you need to throw an upstream mend. If the fly races ahead of the line, you know that you need to throw a downstream mend. If the line makes an “S” shape — with part of the line nearest you racing ahead and the part closer to the fly lagging behind — you know that you need to mend first downstream, then mend just half the line upstream.